“Ravensworth Replacement House,” braddockheritage.org/, accessed April 24, 2019, http://braddockheritage.org/items/show/232. 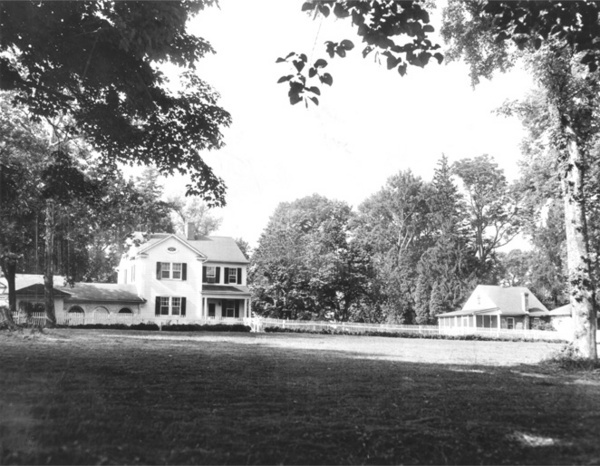 On August 1, 1926, the Ravensworth Mansion mysteriously burned down, though the adjacent outbuildings survived. Subsequently, Dr. George Bolling Lee built this smaller farm house on the property. In 1956, the property and buildings were considered as a possible location for the Northern Virginia University - the future George Mason University, which eventually was built near Fairfax City. The property was later sold and developed into the Ravensworth subdivision. The Lee farm house was demolished to make way for the Ravensworth shopping center and industrial area. The original Ravensworth Mansion was built c. 1797 and became home to William Henry Fitzhugh and his wife Anna Maria. Henry had inherited the Ravensworth property in 1809, while still a minor, upon his father William Fitzhugh's death. Anna Maria's niece, Mary Lee and her husband, Robert E. Lee honeymooned at Ravensworth. During the Civil War, Mary Lee and her children briefly stayed at Ravensworth, but fearing for the safety of her relatives, they moved south to eventually settle in Richmond. The Fitzhughs, who were childless, had willed the 8,000-acre Ravensworth property to their niece. Mary Lee's death in 1873 preceded Anna Maria's in 1874. Therefore, the estate was divided among the five surviving Lee children. William Henry Fitzhugh Lee inherited the mansion and 500 surrounding acres. By 1922, W. H. F. Lee's property had passed to his son Dr. George Bolling Lee, who used the residence as a summer home and hired overseers to operate the farm. Star Collection, reprinted by permission of the DC Public Library; Â© Washington Post.